Tim Cook released some interesting information during Apple’s earnings call last month – and it indicates Apple has a strong future in the mobile payments space. The news? Apple has surpassed 800 million iTunes accounts, the majority of which have credit cards attached to them. This is an enormous resource that dwarfs Apple’s main competitors in the area– namely Amazon and Paypal. 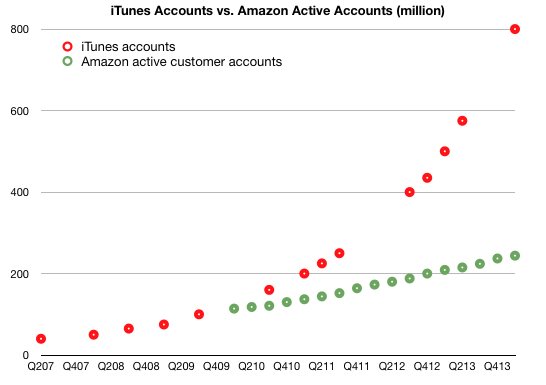 As the chart above shows, Apple has almost four times as many accounts as Amazon does. Paypal, for comparison, has only 150 million user accounts as of Q1’2014. 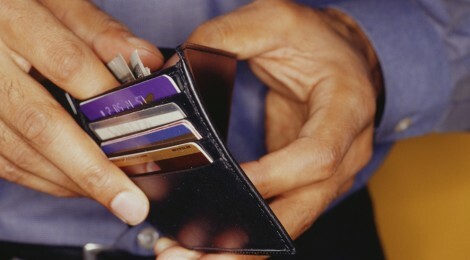 Apple certainly has the ammo it needs to make a serious run at capturing the lucrative payments market. Along with its credit-cards-on-file advantage, Apple has a number of other ingredients in place that hint at future mobile payments success. Market Share: Almost 40% of US smartphones now run Apple’s iOS operating system. Control over hardware and software together gives Apple unparalleled control over on-the-ground consumer interaction with future mobile payments technology. Google’s Android platform, by comparison, is fragmented among many smaller hardware companies – Apple’s main competitor in smartphone hardware is Samsung, which owns 26% of the market. 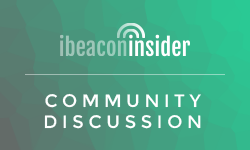 iBeacon: Apple has quickly gained an element of control over the mobile wireless technology that will be a key ingredient to any mobile payments solution, with its SMART Bluetooth protocol, iBeacon. The technology has been rapidly adopted in the retail space and among developers. iBeacon will be the lubricant for any friction-less payments system – and Apple has done a great job standardizing and shepherding the technology. Security: Apple’s introduction of Touch ID fingerprint sensors on its latest iPhone models is a significant hint at its future intentions. Security is a constant concern with mobile payments, and the introduction of fingerprint sensors as an extra layer of security will only help Apple’s case in earning consumer trust. A major obstacle for any mobile payments service will of course be merchant adoption. While the jury is still out on what it will take for merchants to take the plunge into next-gen technology, current iBeacon implementations should be paving the way for further ventures into the mobile tech space. Once merchants begin to warm up to advanced tech as a way to keep up with e-commerce and rejuvenate the brick and mortar experience, Apple will be primed to push into the space and drive a mobile payments revolution.